As we suspected, there were no big announcements from Sony at this year's Photokina 2018 press conference (and nothing about the rumored new APS-C Sony A7000 model). But this doesn't mean they had nothing to say. Here are five things that we gleaned from the 20-minute presentation. Sony Vice President, and Senior General Manager of Sony's digital imaging business, Kenji Tanaka, started off by acknowledging that the rest of the industry had finally entered the full-frame mirrorless market. 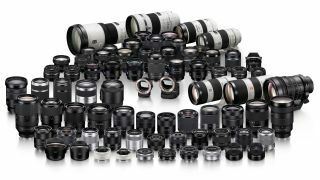 With Nikon and Canon launching full-frame CSC models in recent weeks – and Panasonic, Leica and Sigma about to play their hand – he reminded the assembled journalists that Sony had already been in the game for five years now, since the original A7 launch. For the first half of 2018, Tanaka announced that Sony was number one in the whole full-frame camera market – by both value and volume. In terms of the overall mirrorless market, he explained Sony had been the market leader from 2010 to 2017 inclusive, again by both value and volume. 3) Do mount sizes have to be bigger for higher image quality? As a subtle riposte to Nikon, who have made big claims about the image quality improvements made possible by the larger mount diameter of its new Z mount, Tanaka answered his own question with a big 'No'. He cited the Sony FE 400mm f/2.8 GM OSS as a recent addition to the lens that had got critical support from professionals worldwide, and then cited the pre-Photokina launch of the Sony 24mm f1.4 G Master which he claims has excellent corner-to-corner sharpness, and is designed to suppress sagittal flare. Sony now has 48 E-mount lenses, and has a further 12 in its current roadmap, so will have 60 in its line-up in the near future. But Tanaka assured us that they will not be stopping there... He pointed out that Sony is prepared to share the basic specification of its mount with other manufacturers, so that there is a wider choice of lenses. E-mount is not just about full-frame cameras... and it's not just about APS-C cameras too. Tanaka pointed out that the mount is also used on two of its pro camcorders and one of its cinema cameras. This interoperability is done without the need for adapters, he added. He cited that you could use an A7R III with the Sony EP Z 18-110mm lens, and you would have a very competent Super 35mm cine set-up.